It was more than half a century ago, the last week of November, 1945, and the East Coast of the United States was besieged by a violent storm, of rain and snow and exceptionally high tides, all whipped into a frenzy by near hurricane force winds. In Lakewood, New Jersey, a chambermaid was crushed to death when a hotel chimney crashed through the room where she was sleeping. In Jersey City, a railroad worker was killed when he was blown out of an open freight car. In New York, all planes were grounded at LaGuardia field, many of them sitting like giant ducks in water that had washed in from Flushing Bay and made half the field a lake. In Boston, 7,000 soldiers returning from overseas duty in World War II cursed their fate because the four troopships that held them were rocking in the outer harbor, unable to dock because of the fierce winds. And near Fairfield, Connecticut, on a bleak and wind-tortured reef in Long Island Sound, something wonderful happened. Two men stranded on an oil barge and in peril of being washed overboard were lifted to safety by a hoist on a Sikorsky helicopter. 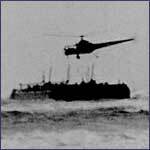 On that day, Thursday, November 29, 1945, the helicopter entered a new and promising age. 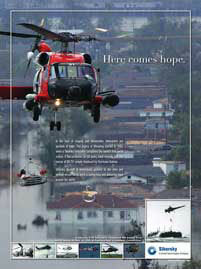 Helicopters had been used for military, and even civilian, lifesaving missions during the latter part of World War II. On January 3, 1944, a Sikorsky helicopter based in Brooklyn was used by the Coast Guard to fly plasma to injured crewmen of the USS Turner after the destroyer exploded off Sandy Hook, New Jersey. Later in the year, a helicopter landed on a sandbar in Jamaica Bay, New York, to rescue a teenager who had become marooned there, and, on the other side of the world, a helicopter was used in a combat rescue mission for the first time. An Army lieutenant rescued the pilot and three passengers of a light plane that had been forced down behind enemy lines in Burma. But in those cases the helicopter had landed to perform the missions. At Fairfield it did not land because it could not land. Waves were washing over the barge, making a landing impossible. And no boats could reach the reef because they would be hurled onto the rocks by the waves. An attempt by men on a small surf boat to get a breeches buoy to the men on the barge had also failed. The use of a hoist to lift the two men to safety was the concluding act of a high drama, played out before a somber group of people, including Sikorsky employees standing on a beach watching and hoping, and perhaps silently praying. They knew how high the stakes of failure might be. What could have been one more tragedy of the sea started the day before. In mid afternoon, Texaco barge 397, with two men aboard, broke adrift from an oil tanker off Bridgeport Harbor and four hours later, in the dark, smashed onto Penfield Reef off the neighboring town of Fairfield. In good weather and at low tide the reef, which lies a mile offshore, is a pleasant vista of huge rocks known locally as 'the cows" because they look like the backs of a herd of grazing cows. At high tide, the cows disappear. And in bad weather, in any tide, the reef is a perilous place. During the night, the two men on the barge - Capt. Joseph Pawlik and crewman Steven Penninger - huddled in the cabin and wondered whether anyone had seen the flares they had set off. As dawn broke, the barge and the two men seemed doomed. Methodically, giant waves were stripping away the barge's deck and superstructure. "The police called us and said the barge was in a hell of a shape and asked if we could do anything,' says Jimmy Viner today at age 87. "I said, 'sure could." His real first name is Dmitry but he never liked that and quickly adopted the name Jimmy. 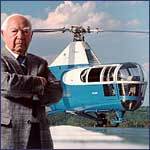 Viner even in 1945 was a legend at Sikorsky Aircraft. He was the salty little guy who at age 15 had followed his uncle, Igor I. Sikorsky, to America, went to work as one of the first employees of Sikorsky Aero Engineering Corporation on Long Island, and eventually became the company's chief test pilot. A test pilot in the infancy of aviation was a job that did not promise much longevity but Jimmy Viner did not look on it that way. He trusted himself. He trusted his uncle. "I never thought of crashing. If you thought it would go well, it did. You developed faith in the machine. If you don't have that attitude, you should get out of the business.' He also had faith in something else. "God was good to me." When the call for help came, 36-year-old Jimmy Viner yelled for a friend, Capt. Jackson E. Beighle who was an Army Air Force representative at Sikorsky. They jumped in the first available helicopter, Jimmy at the controls, and within minutes were hovering over the crippled barge, where they saw one man come out of the cabin below and set off a red flare. They dropped a rope with a weight and a message. They wanted to know how bad it was down there. In a few minutes, they pulled up the message bag, with a return note. It was very bad. Eight tanks were leaking. The cabin was full of water. The two men were afraid the barge would break up. The two men in the helicopter now knew what they had to do. Back at the Sikorsky plant was an R-5 helicopter, a model that first flew two years earlier as an observation and rescue aircraft. 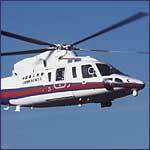 The helicopter recently had been equipped with a hydraulic hoist for experimental purposes. 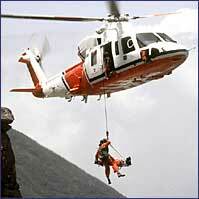 The idea of pulling someone out of danger by a cable from a helicopter was a new concept. Only three months before, the Coast Guard held a public demonstration of the hoist at its helicopter facility at Floyd Bennett Field in the New York metropolitan area. But the concept had never been tested in an actual crisis. Now, unexpectedly, the hoist and the helicopter were going to be put to the ultimate test. If both didn't function correctly, someone might die. But if the rescue wasn't attempted, two men might die anyway. There really was no question. 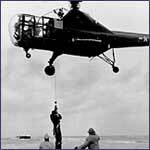 The first helicopter was quickly flown back to the plant and the R-5 with the hoist was readied for flight. "We had to get a rotor blade that had been taken off it and stored but we got it ready in a very short time,' Jimmy Viner recalls. 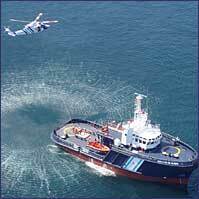 In a matter of minutes the R-5 was hovering over the barge, dropping a note that Capt. Beighle had scribbled, telling the men below to get into the harness that was going to be lowered. The harness was a simple device that looped under the arms. Each man would have to hold onto the cable over his head. Otherwise, he would drop out of the harness. It worked. The first man, Penninger, was lifted quickly out of the swirling waters on the barge. But there wasn't enough room for him inside the helicopter's two-seat cabin. He was transported to the beach half-inside and half-outside the cabin, hanging onto Beighle while Jimmy Viner fought the winds. The experience of the second man, Pawlik, the barge captain who had observed the tradition of the sea in being the last to leave his ship, was much more frightening. He was being lifted up when suddenly the hoist jammed. He was hanging 30 feet below the helicopter. And in that position, holding onto the cable for dear life, he was transported to shore in winds so fierce that the sand on the beach was blowing up in sheets. It was a sight cheered by the people on the beach and captured on film by a news photographer. The next day, newspapers all over the country and the world carried the picture of Pawlik hanging in the air, heading for safety. Perhaps it was the timing. World War II, the greatest bloodbath in the history of man, was over. A new age was dawning which had to be better, and here was American technology being used to help people. Perhaps it was because it was a story with a happy ending for a change. Perhaps it was because the picture of the rescue was so riveting. Perhaps for all of those reasons, no one could be unmoved and unaware that something important had happened, that people trapped in natural or man-made disasters did not necessarily have to die. In the 60 years since, it is estimated that more than a million lives have been saved in helicopter rescues, from sinking ships, earthquakes, highway accidents, from landslides, volcanic eruptions, fires in tall buildings and, of course, in military conflicts that unfortunately still occur with regularity. 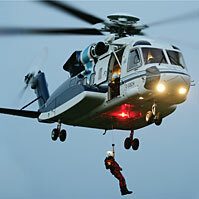 Today, helicopter rescues are made easier by faster and quieter flying machines and many new technological innovations. 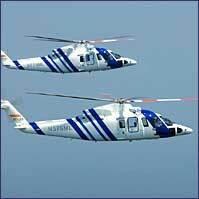 With an automated flight control system, a helicopter may actually do much of the flying by itself, in any weather. 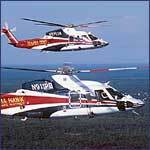 The contemporary Sikorsky helicopter knows exactly where it is at any time and can find any location within its maximum range by itself. Some helicopters may be refueled in the air. 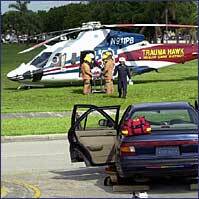 Once, the eyes of the pilot were the eyes of the helicopter. Now, helicopters are equipped with such extended eyes as radar, low-light television cameras, forward-looking infrared, radio direction finders and computerized navigation and search capability. A small boat or person in distress might be spotted briefly in the water but then be lost in turbulent seas. Today, by the touch of a button in the cockpit, the helicopter will swiftly bring itself into a hover, insuring that the boat or person will not be lost. Saving lives is an exact science today. And even after half a century, there is still a postscript or two about one of the first, and greatest, steps in that science. 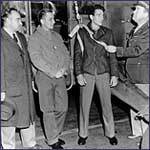 The first is that Jimmy Viner never again saw the two men he lifted to safety on November 29, 1945. "I guess maybe I should have kept in touch, but I didn't.' He did keep in touch with his fellow rescuer. Beighle later joined Sikorsky Aircraft after he was discharged from the service. They remained close friends until Mr. Beighle's death six years ago. 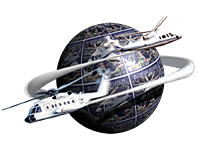 A second postscript is supplied by Sergei I. Sikorsky, the eldest son of Igor Sikorsky who followed his father into a career in aviation and retired as an executive of Sikorsky Aircraft a few years ago. Sixty years ago, Sergei Sikorsky was a young enlisted man in the Coast Guard and one of the group experimenting with hoists at Floyd Bennett Field. When he heard that his older cousin, Jimmy Viner, had actually rescued two men from a barge in Long Island Sound, he was more thrilled perhaps than anyone else. He knew a secret about Jimmy Viner and what it took to go out in high winds, flying close to the water and with the real possibility that he could wind up in those monstrous waves. The test pilot, the man known for his fearlessness, in reality had one major fear, said Sergei Sikorsky. 'He was always terrified of water. He couldn't swim."